Happinet actively invests in areas with potential for growth and high profitability, examples of which include investments in R&D for new businesses and collaborative partnerships with other companies. Happinet also aims to secure a sufficient amount of internal reserves in order to reinforce its management foundations, while maintaining appropriate dividend payouts. These are all done while giving comprehensive consideration to the company’s profit earnings and future business development over the medium to long term. 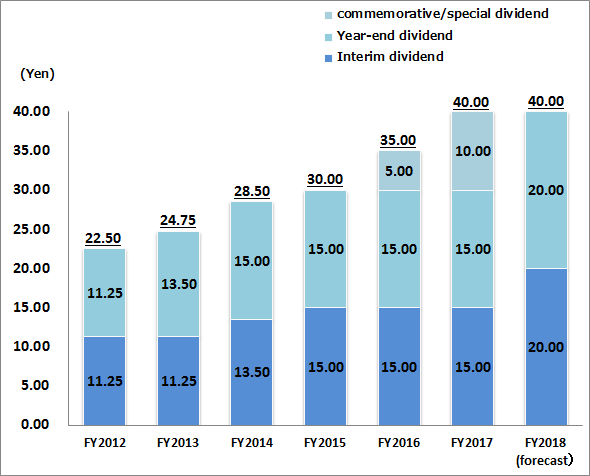 Happinet makes it a policy to distribute dividends twice a year, in the form of an interim dividend and a year-end dividend. The amount of the year-end dividend is decided at the general shareholders’ meeting, whereas the interim dividend is decided at the board of directors meeting.